Design an attractive vegetable platter. If you're hosting a holiday party or other special event, create a vegetable platter arrangement that will be irresistible to your guests. 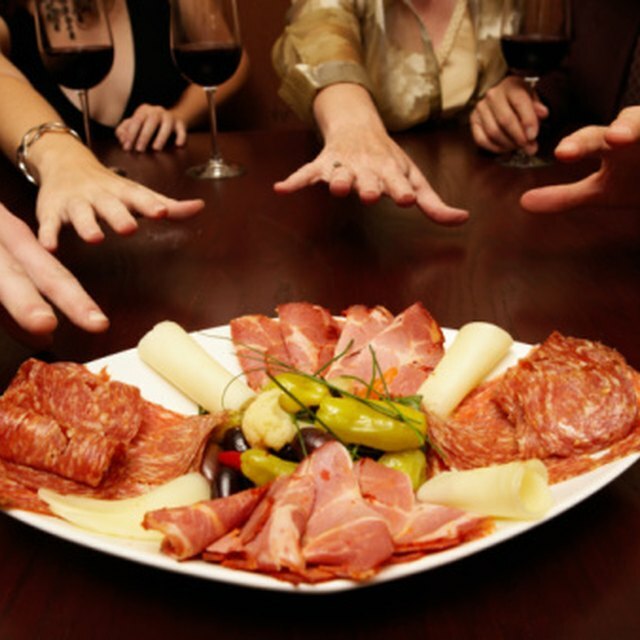 Vegetable platters, which consist of several different types of cut-up produce and dips, make colorful appetizers. The vegetables are healthy and filling, as they're easy for party-goers to eat while mingling. Create a colorful vegetable platter that will add vibrancy to your appetizer or dinner table. Plan the arrangement according to the vegetables' colors, and avoid using multiple produce items that are all the same color. Wash and slice red, green and yellow bell peppers and carrots. Add bursts of bright red with juicy cherry tomatoes and spicy radishes. For an artistic look, carve the radishes into charming rosebud shapes. Group each type of vegetable together and place a dip, such as ranch or hummus, in the center of the arrangement. Spear a variety of fresh vegetables on wooden skewers for an eclectic arrangement. Guests can choose their favorite vegetables and eat them off of the easy-to-hold sticks. You can slide a variety of vegetables, such as asparagus, radishes, cherry tomatoes, mushrooms, cauliflower and broccoli florets and baby corn, onto the pointed skewers. Decorate a large serving tray with small glass vessels filled with dry beans, and nestle the ends of the skewers into the beans to display. 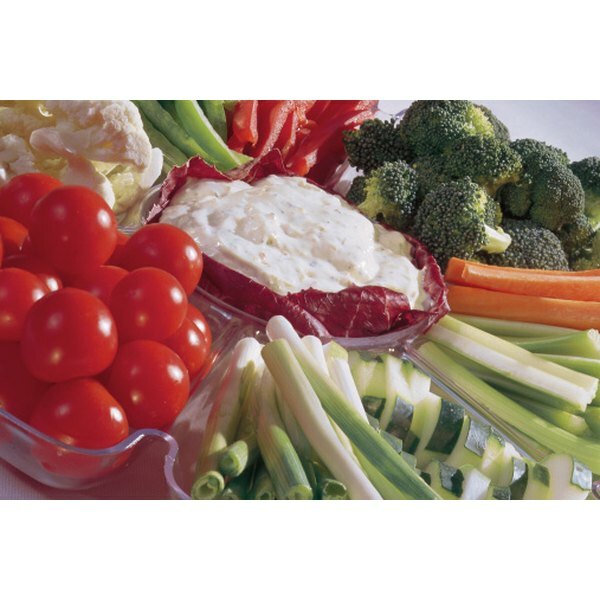 Make the vegetable dip holder the star of the vegetable platter arrangement. Fill hollowed-out green, red or yellow bell peppers or fresh bread bowls with homemade ranch or blue cheese dip. For a festive look, use a small or medium pumpkin to hold dips during a Halloween or Thanksgiving get-together. Other dip bowl ideas include hollowed purple cabbage heads and vintage crystal candy dishes. For a festive look, arrange a vegetable platter according to what holiday you're celebrating. Fill a Christmas tree-shaped platter with a variety of green vegetables, such as broccoli florets, celery sticks and green pepper slices. Place cherry tomatoes throughout the arrangement to resemble ornaments. Decorate a heart-shaped platter with red vegetables, such as cherry tomatoes, red bell peppers, red onion slices and radishes, to commemorate Valentine's Day.